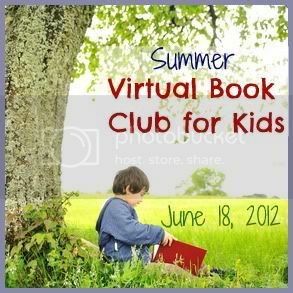 Welcome to our June Summer Virtual Book Club! I am so excited to be joining with 20+ bloggers to share a variety of activities inspired by books written by the awesome Mo Willems! 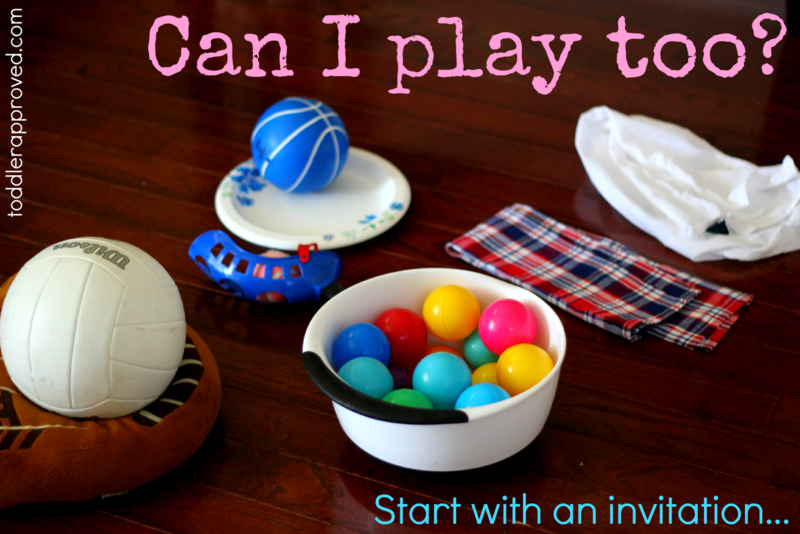 Today I will be sharing a silly activity that our family did together, inspired by the book Can I Play Too? from the Elephant & Piggie series by Mo Willems. At the bottom of this post you will find a linky where bloggers will be adding their Mo Willems book inspired posts too. Some will add posts today and some will add them later this month or early next month. If you have created an activity or blog post inspired by Mo Willems, feel free to grab the button at the bottom of this post, add it to your blog post, and link up! We're in full on summer mode, which means I am trying to keep things a little more open ended at our house! We just got back from an awesome trip to Hawaii and had a lot of plane time both ways to read new books. The Elephant and Piggie Series books were introduced to us by our friend Danielle in her recent post, 8 1/2 Reasons Why I Love Elephant and Piggie More Than the Cat and the Hat!... so we had to pick some up! 2. We read Can I Play Too? by Mo Willems. 3. We explored the ball play materials and invited "friends" to come play. After we were done reading and talking about the book a bit, we headed to the living room to explore all of the materials I had set out. As soon as my son saw all the cool things I'd left out, he ran to get his dad and little sister to come join him! The basic story of Can I Play Too? involves Elephant, Piggie, and a green snake that want to play catch together. The snake doesn't have any arms, so that makes playing catch a bit difficult. It is funny to see how he tries to play catch with his friends. My son thought the book was hysterical. A helmet was perfect to protect our heads from all the BONKS! My husband said this game was seriously his favorite ever. He'd make a pretty good snake. We pretended the net was his long tongue/mouth. My son threw the balls and my husband tried to catch them... then we switched. 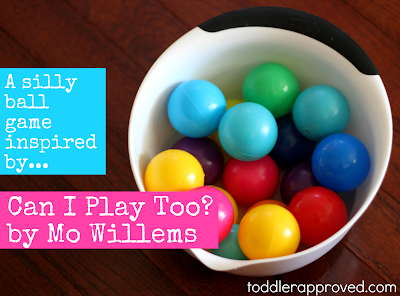 Sometimes we actually attempted to toss the balls back and forth, but it was hard! they usually went BONK! on their heads! This little snake had a hard time catching balls with all the giggling going on. I highly recommend you set up an area in your house (or outside) for some Elephant and Piggie ball play fun! Make sure to join in too! This book also brought about some great conversations with my son about including friends (and his sister) in activities (even if they seem like they can't participate). We made a list of several things his sister can't do and then we brainstormed all of the creative ways that we could help her do them (or ways we could do them differently so that she could be included). 1. She can't play catch because she doesn't know how. I could teach her or we could bounce/roll the ball instead. 2. She can't read a book by herself. We can open the book and turn the pages for her and read the story. 3. She can't put dishes in the sink. Mom can lift her up so she can do it herself or I can help her put them in. 4. She can't make a volleyball net or reach it. I can lift her up and then she could bop the ball herself. I thought his ideas were pretty cute and were a great jumping off point for future situations when he says, "____ can't play because she can't do ____." It was great to emphasize that with a little creativity, we can include everyone! Now that we've shared our silly activity with you, we're excited to see what you came up with! Please add your links to any Mo Willems inspired posts below. Link up only posts inspired by Mo Willems that share children's book inspired crafts, activities, recipes, etc. Any other posts will be deleted. Add our June Summer Virtual Book Blog Hop button to your post (below). This blog hop will be open from June 18th (12am PST) to July 14th. Come join the fun anytime and link up! Such a fun and creative game. This blog hop is giving us tons new books to read and activities to try! I totally love what you did, and am completely in love with this book. We made a snake sock puppet and had a lot of fun rolling the ball and bonking him on the head! I'm sharing it tomorrow. I love those photos! I share it on one of my Facebook Pages, The Play Connection, Inc.